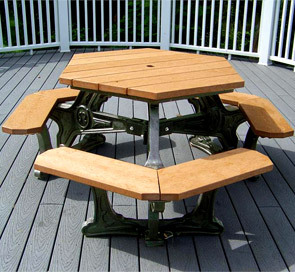 A perfect addition to parks, picnic areas or any outdoor eating area, this recycled plastic hexagon picnic table comfortably fits six. Decorative details on the recycled plastic frame add elegance and sophistication. Table frame comes standard in black, while the table top and seats are available in charcoal, weathered wood or cedar.